More than 40 years after founding Apple Computer, Steve Wozniak has a lot to say about the early days of the world's richest company -- and about technology, learning, and being a born engineer. In the early Seventies, Wozniak read about phone phreaking, in which "phreakers" made free phone calls by using electronics to mimic the tones used for dialing each number. To learn how to do it, he went to the only place he knew that had books and magazines about computers: The Stanford Linear Accelerator Center. He went on a Sunday and walked right in. "The smartest people in the world don't lock doors," Wozniak said. A similar philosophy led him to give away his design for what later became the Apple 1. After drawing up plans that would let people build their own computer for US$300, he handed them out at the Homebrew Computer Club, an early gathering place for tinkerers who helped launched the PC revolution. He didn't even include copyright notices. "My motivation wasn't to start a company, wasn't to make money, it was actually just to show off my engineering excellence," he said. It was a non-engineer friend, Steve Jobs, who persuaded him to monetize both phreaking and the personal computer. Wozniak always sought to build things with not only the fewest parts but also the cheapest ones. After learning about phreaking, he set out to build a machine for it in his dorm room. "I bought a sack of diodes at Radio Shack that weren't guaranteed. And about half of them were bad, but I didn't know which half. ... When a tone didn't work on my box, I would go to this guy who had perfect pitch. He was a musician in the next room over." The early days of Apple are the stuff of legend and pop culture now, but not all the stories are true, according to Wozniak. One is a scene in the Ashton Kutcher film "Jobs" in which Jobs pushes Bob Dylan on a Beatles-loving Wozniak. When they met, Jobs was 16 and had no music albums at home, Wozniak said. "I"m the one who introduced Steve Jobs to all this Bob Dylan stuff." The two ended up going to many concerts and collecting bootleg recordings and analyses of Dylan's lyrics. If he were young today, Wozniak would go into robotics. He wants to design a robot that could go into a house it doesn't know, find the kitchen on its own, and figure out how to make coffee. He's not too worried about the machines taking over. "It's getting scary the direction it's heading, but it'll take a long, long time before there's something like a master race over humans. 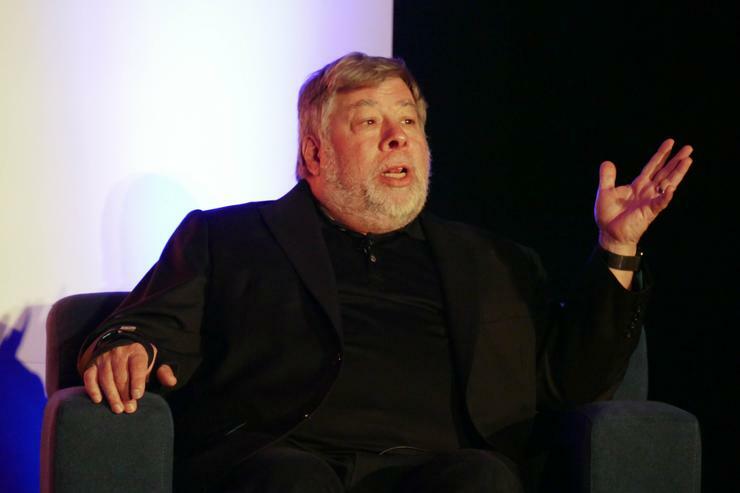 They'll need us," Wozniak said. Wozniak, who has worked as a grade-school teacher, said motivation is more important than knowledge from books or teachers. "If you want to learn something, you'll get there," he said. It's good for children to learn programming, but they should wait until age 12 for their brains to mature, he said. Before he and Jobs founded Apple, Wozniak offered his PC designs to Hewlett-Packard, where he worked on the company's legendary calculators. He didn't want to risk that position by starting a new company. The fifth time HP turned him down, he reluctantly left. Forty years later, in a very different Silicon Valley, the job of Wozniak's dreams is a poignant vision: "I was going to be an engineer forever at Hewlett-Packard, because you could get old and still be an engineer there. How lucky for me! I would never lose my job at HP."